When my daughter was about 4 years old she simply hated taking baths. Bath night was absolutely terrible for both me and her with her crying, but that truthfully all changed once I bought her a baby doll that could go in water. Simply having that doll to play with and pretend like she was swimming or giving the doll a bath made bath time so much more relaxed for me and a lot funner for her. Although she eventually outgrew her hatred of baths, that bath time baby doll was like a life saver. If you are having trouble with your little girl not wanting to take baths or maybe she has just been asking for baby dolls that go in water, I have found the very best dolls that you can get wet in either the bath or even in the pool. Having two daughters I have done a lot of doll shopping in the past several years. I can tell you, without a doubt, there are some dolls that are simply not worth the money and won’t be played with while there are other, quality dolls that I would recommend to other parents. This is the actual updated version of the baby doll that I bought for my daughter for use in the bath. Corolle are known for their quality dolls and this bath girl doll is definitely a great choice. This doll is a lot more realistic and lifelike than the super hard cheap plastic dolls that you may have seen at your local discount store. The fact that this doll looks and feels more like a real baby makes it a lot more attractive to young children. Not only will children actually want to play with this doll, but parents will love it as well. If you take any old baby doll and stick it in the water, you’ll find it starts to smell and will eventually grow mold instead because all the water doesn’t drain out properly. The doll was specifically designed to be able to go in the water. You can easily drain all the water from the doll by hanging it over the bathtub by the tab on the back of the neck. All of the water quickly drains out and the baby doll is completely dry. 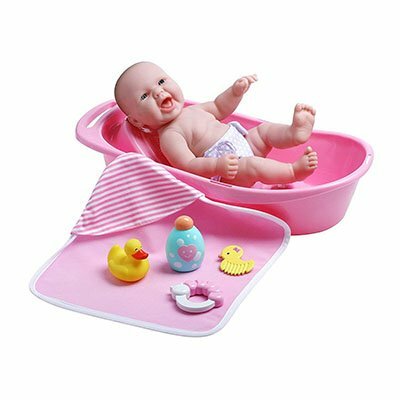 What is also pretty cool about this baby doll is that it is not only great for the bathtub, but your child will want to play with it outside of the bath as well. The expressive face and the fact that the eyes even close make this baby doll a child’s favorite. It even has vanilla-scented skin and comes with a fun rubber duck for her toy. There are a few different versions of this baby doll that can go in water. They are all made from the same company but have different designs and there are even boy baby dolls as well. There are three different newborn baby doll bathtub sets that I recommend from JC Toys. Each one comes with a vinyl doll that can go in water as well as a doll size bathtub and accessories. The difference in the dolls is the appearance of the doll as well as the difference accessories that come with each one. These dolls look super realistic especially with their smiling and laughing faces. The vinyl they are made from is completely washable and they are also baby dolls that can get wet. The neat thing about these dolls is that they come with their very own bathtubs and accessories so they aren’t just for taking in your child’s bath. They can be used for pretend play outside of the bathtub as your little one can pretend they are bathing the dolls in their very own tubs. Plus all the accessories like the extra diapers, pacifier, and bottle are lots of fun to play with as well. According to almost all the reviews there have been no problems with water getting inside the doll even though the doll is jointed and the arms and legs move. With no water getting inside you don’t have to worry about mold growing or ruining the doll. This makes a super cute gift for any little girl and can make bath time a whole lot more fun as well. How adorable is this little ball with the hooded kitty bathrobe? Not only is this doll super cute but it’s super functional for water fun as well. It features a QuikDri body that allows all the doll to dry out much faster than your average ordinary type of doll. There is an attached loop on the back of the doll that allows for easy hanging to allow the doll to dry overnight. Most parents reported that the doll is able to completely dry overnight. It also comes with a hooded bathrobe and a washcloth so your little one can pretend she is giving her a bath and drying her off afterwards. She even has an adorable swimsuit on underneath so she is perfect for taking to the pool as well. The size of the doll is perfect for toddlers and preschoolers but you may even find some older kids around 5-7 years old will enjoy playing with this bath time baby doll as well. There are also a few other Adora Bath Time baby dolls that come with different animal themed bathrobes and slightly different doll features. 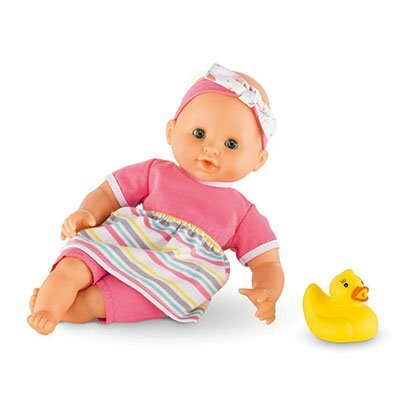 Although you may find several more baby dolls that can go in water, you want to make sure that you always check out the quality of the doll as you’ll find some are made of a cheap, hard plastic while others simply aren’t as waterproof as the company says they are. I suggest that you stick with one of the best baby dolls that can get wet listed in this guide to ensure that your child has fun playing with the doll (all of them are super cute) and you get your money out of a quality toy.